The RV is like new (maybe it is new?) The owner was nice and friendly. We had a great trip. 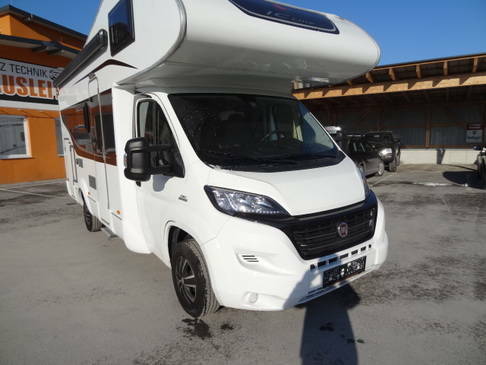 Up to 5 people can travel with this semi-integrated motorhome, making it ideal for families and groups. Air conditioning ensures pleasant temperatures while driving. The canopy awning provides shade on sunny days. There are 2 single beds in the rear, which can be connected to form a large double bed in no time at all. A drop down bed above the dinette offers sleeping places for 2 more travelers. The seating group itself can be converted into an additional bed for a fifth person. The kitchen has a sink, a 3-burner stove and a fridge with a freezer compartment. The bathroom is equipped with a shower, a sink and a toilet. Renters consistently rate this vehicle as excellent. This vehicle can be booked instantly. A great choice for groups of 2 to 4 travelers. 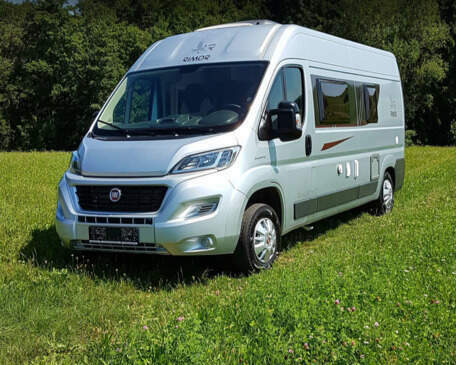 Reisemobil für 2 bis 3 Personen mit Vollausstattung (ready for tour) inkl. Standklimaanlage, Markise, Navi mit Rückfahrkamera, Fahrradträger (2 Räder), Campingmöbel, Koch- und Essgeschirr. Der Pössl Roadcruiser vereint Agilität mit maximalem Platz und Schlafkomfort auf 6,36 Metern Länge. Er verfügt über einen leistungsstarken (163 PS) und umweltfreundlichen (Euro 6d temp) Antrieb, eine schöne Schlaflandschaft mit Längsbetten und einem innovativen Raumbad, das den vorhandenen Platz in einem Kastenwagen optimalst ausnutzt. Der hochgesetzte 90 Liter Kompressorkühlschrank ist komfortabel erreichbar, leise und hat eine hervorragende Kühlleistung bei sehr geringem Energieverbrauch (Strom). Up to 6 can travel with this cabover motorhome, making it the ideal choice for a family vacation. A navigation system, a large rear storage compartment and air conditioning in the cab are just a few of the campers built-in extras. An awning provides shade on sunny days. The rear bunk bed can sleep 2. The double bed in the alcove also has 2 sleeping places. The dinette transforms into a bed for 2 more campers in the blink of an eye. The kitchen offers everything you need for cooking on-the-go with a refrigerator, a 3-ring stove and a sink. In the adjoining seating area there is enough space for all the passengers to eat and pass the time together. The bathroom has a washbasin, toilet and shower. der perfekte begkleiter für Städtereisen oder sonstigem. Alles inklusive auf kleinstem Raum. Up to 6 can travel together in comfort with this class C camper. It is ideal for a vacation with friends or family. Technical highlights include a rearview camera, sat-nav and cruise control. A bike rack, awning and satellite TV are also included. The double bed in the rear offers sleeping space for 2. Two additional guests can sleep in the double bed in the overcab alcove. In addition, the dinette can easily convert into a bed for 2 more. The centrally-placed kitchen is equipped with a 3-ring stove, sink and fridge. The bathroom has sink, toilet and shower. 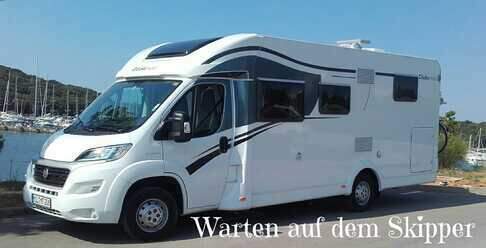 HYMERCAR Camper Van grenzenlos flexibler Alleskönner nur 5,40 m Länge !! A great price. A great choice for groups of 2 to 4 travelers. A great price. A very good option for couples or families. Sip a delicious cup of coffee beneath a bright umbrella in a bustling, sunny Vienna café. Enjoy a wide range of Austrian alpine scenery (mountains cover over half of the country’s surface) by taking a hike in the clear, bright air. Take a trip to Salzburg (a must for fans of Mozart and The Sound of Music) and from there trek down to Eisiesenwelt to experience a breathtaking labyrinth of ice caves. Does all this sound too good to be true, like something out of a dream? Luckily, it’s not! All of these sights and more are just a drive away with Campanda’s RV rental in Austria. Take advantage of our fantastic range of vehicles to drive to one of the most beautiful countries in Europe. In Austria, the hills are alive with more than just the sound of music. Austria is at the core of Europe and is a bustling hive of culture. It’s also the beating heart in the center of a territorial grid that allows for easy and convenient travel to other countries. Always wanted to see the glories of Italy? What about Germany or even Hungary? No problem. With a little planning and execution, you can hop in your Campanda RV rental and see all of these places and more. We have 25,000 types of RVs just waiting to be put to use. 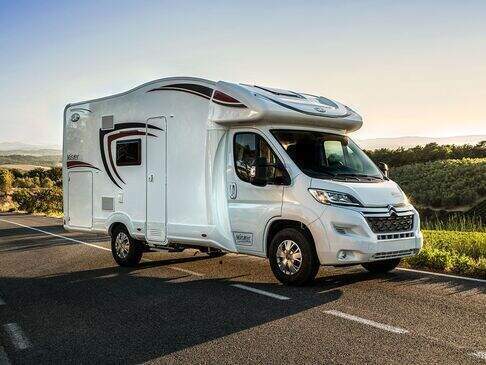 You can choose luxury A,B, or C models, family-sized travel trailers (perfect if you don’t plan to stop much during your road trip), or highly functional vans. The magic of Austria is at your fingertips with our easy-to-use online booking, so feel free to browse our extensive inventory on your own time, compare rates, and choose the RV that works best for you. Our customers come from diverse lifestyles and backgrounds. 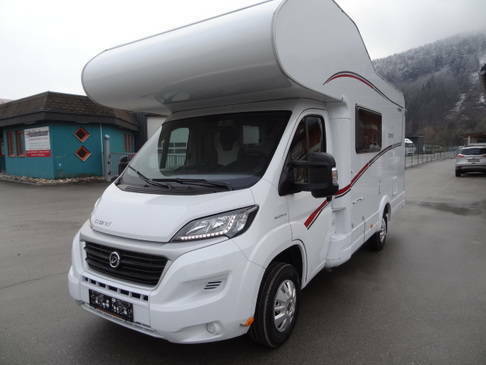 Whether they are millennials, baby boomers, or a retired married couple, we are happy to work with their budgets in order to help them obtain RV rental in Austria that works for them. In fact, saving you money is so important to us that if you find the same RV within 48 hours of booking that is a lower price, we’ll either match the rate or give you a full refund. 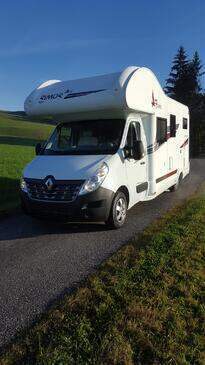 Do you have any questions or concerns about your RV rental in Austria? No problem! Email or call us right away and our outstanding customer support team will help you. We always offer great customer support to our renters in order to make everything as easy as possible. Customer service is the cornerstone of our business, and it’s what allows us to stand out from other campervan companies. In addition to providing you with a ready team of helpful employees, we offer RVs that are regularly maintained in order that they may function at optimal levels of performance. If you experience any trouble on the road or have any concerns once you come in about your RV rental in Austria, feel free to voice them. At Campanda, you’re always number one. •	Innsbruck: As a city in the Alps that’s long been associated with a variety of winter sports, Innsbruck is a popular tourist destination for travelers looking to get away in the colder months. Its picturesque buildings, rich culture, and skiing opportunities offer something for tourist of all ages. It is known for its interesting blend of Imperial and modern architecture. •	St. Anton: Another popular ski resort, St. Anton offers a wide range of skiing, chalets, nightlife, and hiking. •	Linz: As the third largest city in Austria, Linz is equipped with plenty of entertainment for tourists. Visitors can enjoy contemporary art galleries, musical and regular theatre, tennis, concerts, and much more. •	Vienna: It would be a shame to plan a trip to Austria and not make time for this beautiful gem of a city! Vienna is the Austrian capital and is referred to as the “City of Music.” Its artistic and intellectual life was shaped by notable residents such as Mozart, Freud, and Beethoven. It is widely known for its Imperial palaces, as well as for its historic and contemporary buildings that display the works of prominent artists. •	Melk: For travelers searching for a more spiritual experience during their trip, Melk is a great option. Although it is famous as the site for the Melk Abbey, the city also offers an assortment of castles and churches that you can easily access with your RV rental in Austria. 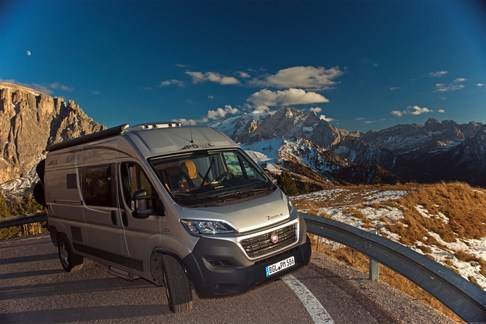 Europe may seem like an elusive, far-off place that’s forever out of reach, but with our RV rental in Austria, this dream can crystallize into your reality. So why wait? Make rental or booking enquires and uncover its secrets today! Hobby Prestige 620 CL - Modell 2019, kompaktes Raumwunder, Ohne Servicepauschale, Nur 250,- Euro Kaution mit Urlaub-Schutz-Paket-Versicherung! This is a very good price. Good choice if you want to relax at the same spot a few days.